For under a grand, Planet X can offer you a Tour De France quality frame, fitted with high speed componentry to give you a chance to experience the ride of a top class TT bike. With high speed specialist machines speeding through the French countryside are flashing across the world on TV and online video channels right now, we're offering you this Stealth Time Trial bike for under a thousand pounds, and it's a machine with a pedigree, as Cadel Evans used this exact model that we helped develop in the 2007 Tour. Our Stealth TT frame heralded our move to carbon and was the launch pad for our high performance direct sales move with Planet X. Working with a leading factory to develop our full carbon time trial bikes (a world first) we assisted on the geometry and shape specifications for this frame, which, being a joint project, also got sold to a bunch of other suppliers. Cadel's sponsor had some stickered up, and we were quite amazed to see "our" bike under Evans for the final TT. Over the last six years, the Stealth has continued to give fantastic performance for time trial and triathlon riders alike, and is one of the most popular machines at UK races. This sub £1000 build is a limited offer, and it's in strictly limited numbers, but if you fancy something different, or can't see what you want, then consider our £1299 Outlaw Special, or our £1099 Rival entry level bike. 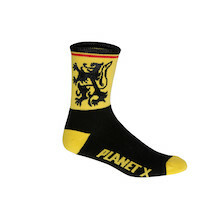 Click here to buy the range of Planet X Stealth Pro Carbon bikes and frames. 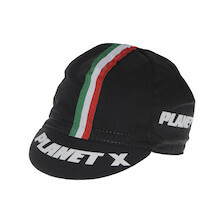 Cotton cycling caps made in Italy for the classic roady look. A good pair of cycling socks are an essential part of your kit and can make a huge difference to your comfort as you ride. These Thicky Merino socks are just perfect for riding in lower temperatures. Feel the advantages of Merino wool and feel the new level of comfort as you ride!